SlopBuster™ Is Designed With Safety In Mind. The U.S. Postal Service and the U.S. Department of Transportation guidelines for installation of posts and mailbox requirements have been established to assure roads are safe for drivers. The SlopBuster Mailbox Protection System has been engineered to comply with regulations that are designed to minimize risk of injury to a driver and passengers when a vehicle hits a mailbox. A SlopBuster System is designed to break away if hit by a motor vehicle. To make this possible the lower bracket of the SlopBuster has two different bolt sizes, the top bolt is a 3/8 inch diameter and the lower bolt is a 1/4 inch diameter low grade steel bolt. When impact of a vehicle occurs the bottom bolt is designed to shear and the upper bolt that is larger in size will stay intact allowing the lower tube to pivot on the upper bolt. The lower bracket will stay in place and as the vehicle moves forward the SlopBuster will fold over at the top, breaking the mailbox post and allowing the vehicle to ride over top of the SlopBuster and the mailbox assembly. Some property owners build massive architecturally designed brick and mortar mailbox stands that are very dangerous to drivers and do not meet the safety requirement established by U.S. Postal and Department of Transportation guidelines. SlopBuster engineers considered safety a top priority during the design process. SlopBuster™ Is Designed For Simple Installation. 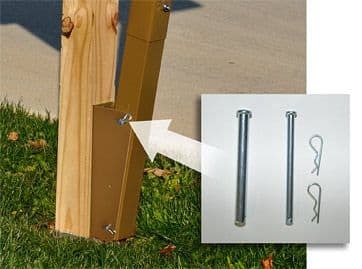 A SlopBuster Kit contains all the parts you need for installing a Protection System for a standard wood post and plastic mailbox system. 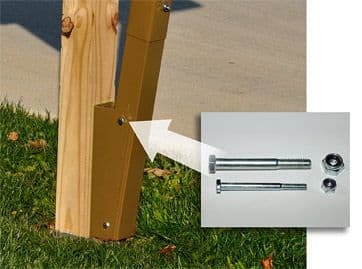 For a decorative, metal post design a remote wood post needs to be installed for mounting of System. SlopBuster has been designed to be easily installed for winter months and removed for storing in summer from season to season by simply removing the two lower bracket & tube bolts.